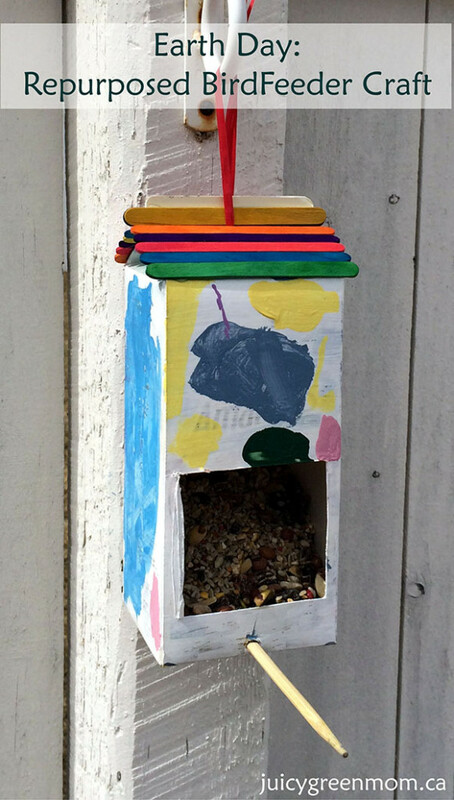 My 3.5-year-old and I had a great time doing this bird feeder craft together on a perfectly spring Earth Day! It was super easy to do, and best of all, I repurposed stuff that was lying around. My favourite! I adapted ours a little bit from this one I saw on Building Rainbows. I cut a rectangular opening in one side of the carton, about 1 inch from the bottom. I used a hole punch to make a hole for the chopstick at the bottom of the carton. I used a pen point to poke a hole at the very top of the carton below the rim. It’s hard to punch through the rim itself because it’s so thick, but it’s easy enough to get right under it and poke a hole on either side. I threaded through a piece of red paper ribbon for hanging the bird feeder. Because the carton I used was coated, I painted a preliminary layer of white acrylic paint and let it dry before I let my daughter do her thing. 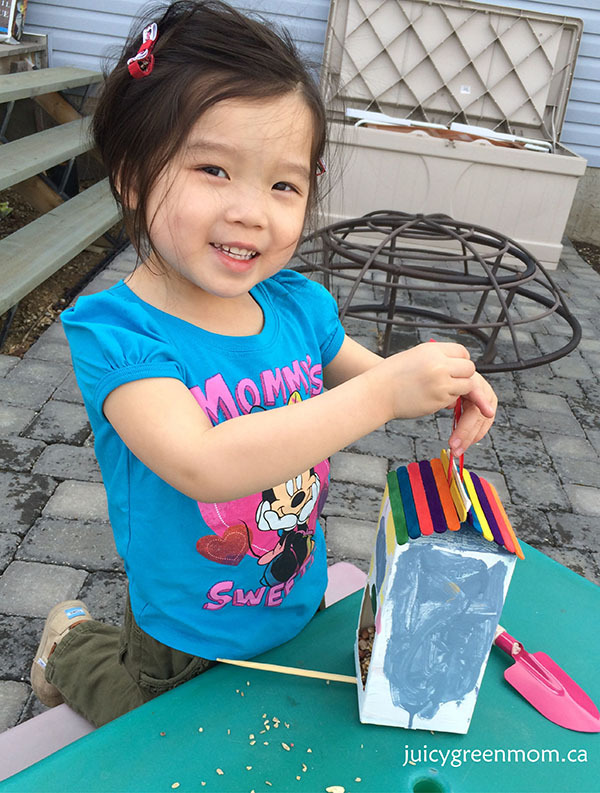 After she painted and it was dry, she helped me glue on the craft sticks along the top to create a pretty “roof”. I pushed in the plastic pouring spout so that it was inverted towards the inside of the carton, and we could easily glue the craft sticks over the hole where it had previously been sticking out. Then we filled with bird food and hung it up! Now we just need to wait for the birds to come! What other Earth Day crafts or activities did you do?